This year, Mass Audubon is partnering with BirdLife International to help coordinate migratory shorebird conservation across the hemisphere. By joining the Friends across the Flyway initiative, Mass Audubon can link up with conservation organizations along the Atlantic Flyway to protect species shared across borders. For birds whose ranges cross international borders, it’s crucial that regional conservation groups coordinate with each other. All threatened or endangered shorebirds in Massachusetts spend half the year in migration or at their wintering grounds. Every year, Piping Plovers, Red Knots, and Least Terns migrate to Mexico, the Bahamas, and even Argentina—and they depend on stopover habitats to feed and “refuel” along the way. Removing just one link in this chain of habitats can spell the demise for an entire population. When making a conservation plan, biologists like to emphasize “habitat connectivity,” or keeping open routes between areas where a species lives. With New England’s shorebirds, this means more than preserving a physical link between protected areas—it means conserving breeding habitat in Massachusetts, wintering habitat in the Southern Hemisphere, and key stopover sites birds use while migrating in between. Mass Audubon’s Coastal Waterbird Program approaches local shorebird conservation from all possible angles. Firstly, Mass Audubon puts boots on the ground—or rather, on the sand—to monitor shorebird populations and develop science-based conservation plans. Then, we work with local and state governments to put those plans into action. This includes setting goals for shorebird recovery, res-siting energy projects, and helping lawmakers identify beaches where shorebirds are threatened by offroad vehicles. So far, the program has been a huge success! Piping Plover numbers have quintupled in Massachusetts since the program started in 1984. American Oystercatchers, once a rare sight in our state, now number over 200 nesting pairs. We’re excited that our Coastal Waterbird Program is linking up with BirdLife and its partners! This suite of organizations can pool resources to protect habitat and produce research on these shorebirds’ global needs. To learn more about Friends across the Flyway, check out BirdLife’s video on Rowan, the cute Red Knot. This entry was posted in Habitat Management, Research and Monitoring, Where in the World? 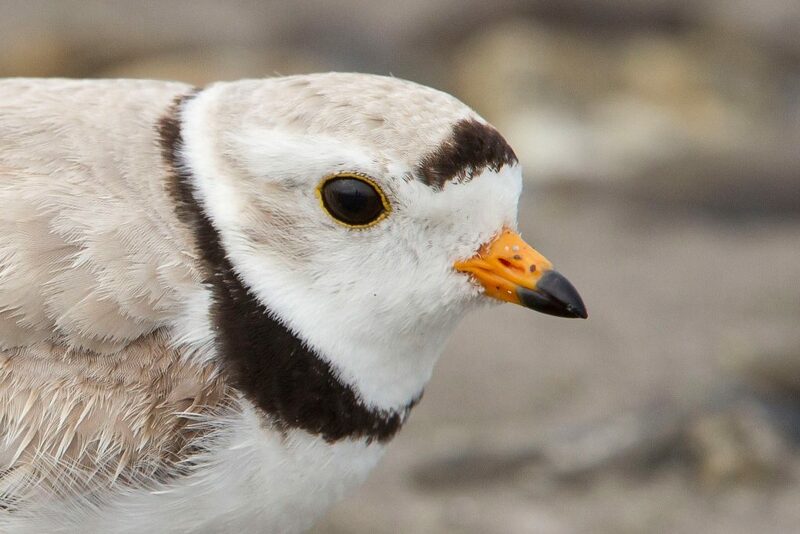 and tagged birdlife international, birdlife shorebirds, coastal waterbird program, international birding, international conservation, mass audubon coastal waterbird program, piping plover, plover conservation, shorebirds on May 25, 2018 by William Freedberg. Where Do Woodcocks Go In The Snow? When winter weather drags on into late March, our earliest spring migrants still show up on schedule! Birders often hear the sharp, reedy “peent!” of American Woodcocks in mild weather amid other spring sounds, like the clamor of wood frogs and spring peepers. Hearing them calling from fields covered in several feet of snow can seem incongruous. So how does lingering snow affect these enigmatic birds’ ability to find food? Woodcocks find insects by probing underground with their beaks. The tips of their beaks pack a bundle of highly sensitive nerves, which they use to pick up on vibrations from insects moving in the soil. The tip of their beak can also flex open while the rest of it stays closed, allowing woodcocks to delicately pick up food without having to pry their whole bill open underground. The ability to open just the end of the beak is called distal rhyncokinesis (rine-co-kin-EE-sis), or simply rhycokinesis when discussing beak flexibility more generally. It’s a trait shared by many members of the sandpiper family, woodcocks included. With such particular feeding habits, spring snowstorms might seem to spell trouble for these ground-dwelling insect-eaters. In particular, 2018 has seen a spate of nor’easters barreling through New England, dumping foot after foot upon snow. Woodcocks can often feed successfully through a shallow layer of snow, but only if the ground is not frozen through. If the ground has already thawed, a covering of snow will in fact keep the ground from freezing fully again, if temperatures return below freezing. But March 2018 has seen snowpack deeper than a woodcock’s bill is long, even when the ground hasn’t been frozen solid. In years like this, woodcocks feed near any natural features that keep snow off the ground—along the banks of streams and flowing water, or under coniferous trees that partially shelter the ground from snow. Birders in the know will look for them in these areas, and are careful not to scare or flush these easily-stressed birds. Their flight displays have continued along the edges of fields so far regardless of snow cover, and should keep going into April. For more tips on how to find woodcocks, check out our list of sites and programs! 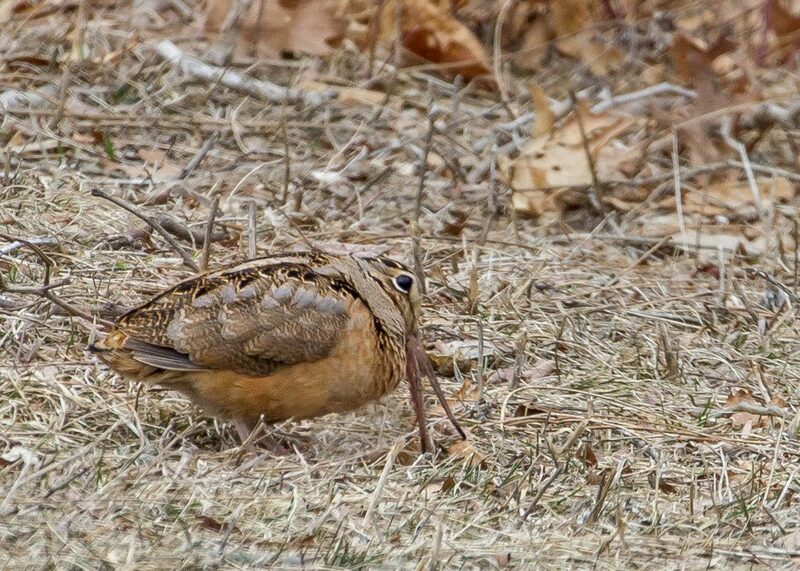 This entry was posted in Birds and Birding, Climate Change, Grassland Birds, Resources and tagged american woodcock, insectivores, rhyncokinesis, shorebirds, upland birds, woodcock, woodcocks and snow on March 27, 2018 by William Freedberg.